In general see Baumgartner, RE s.v. "Arsamosata"; Tcherikover, HS 82; Walbank, Comment. 2:99; H.E. Hewsen, REArm 16 (1982) 136; Schottky, Media 105, 175-77; id., BNP s.v. "Arsames 4"; Burchard and Treidler, BNP s.v. "Arsamosata." 1. For a version of the toponym similar to that found in Polybius see Not. Episcop. 1.950 (᾽Αρμουσάτων, ed. Parthey). The (probably more correct) toponymic form Arsamosata is found in Tacitus (Ann. 15.10.3), Pliny (NH 6.26), and Ptolemy (5.13.19). See also Geog. Rav. 2.12.7 (p. 23, "Arsamotasa," ed. Schnetz) and 2.13.18 (p. 25, "Arsamosatim"). 2. For Arsames see, for example, Schottky, Media 100-116, 234-35, 242, et passim; and Schmitt, Antiochos 37-38; ARSAMEIA on the Euphrates; and ARSAMEIA on the Nymphaios. For Arsames as the possible founder of Arsamosata see, for example, Walbank, Comment. 2:99 (citing Beloch, GG2 4.2:361 and Holleaux, Études 5:321-22; as far as I can see, however, the latter does not make this claim) and Schottky (Media 105-6 and BNP s.v. "Arsames 4"), who suggested that this Arsames also founded ARSAMEIA on the Euphrates and ARSAMEIA on the Nymphaios in Commagene. Cf. M.-L. Chaumont in Arméniens 94 ("Il est permis de supposer que ce nom typiquement perse d'Arsamès [Archama] a été commun à plusieurs membres de la dynastie de Sophène. C'est l'un d'entre eux qui aura été le fondateur de la ville d'Archamachat, l'Arsamosate des auteurs grecs ... sur l'Arsanias."). 3. On the location see Sinclair, Eastern Turkey 3:112-15 (sketch map and plan on pp. 109, 114). Earlier, J.G.C. Anderson (JHS 17  25 and map in CAH 10 opposite p. 255) and Le Strange (Caliphate 116 and map opposite p. 87) located Arsamosata at Shamshat/Shimshat. See also Walbank, Comment. 2:99; and Hewsen, REArm 16 (1982) 137. In general see James, Dict. Geog. s.v. "Artaxata"; Baumgartner, RE s.v. "Artaxata"; Tcherikover, HS 82; Treidler, KP s.v. "Artaxata"; Manandian, Armenia 110, map on p. 111, et passim; Burchard and Treidler, BNP s.v. "Artaxata"; R.H. Hewsen, REArm 16 (1982) 125-26 (on Ptol. 5.13.12 and 8.19.10; Ptolemy mentions Artaxata among the towns of Armenia). For the results of excavation at Artaxata see Invernizzi, Ai piedi dell'Ararat (bibliography, pp. XIX-XVI, and introductory essay by Invernizzi, pp. XIX-XXIX). 1. With regard to the relationship of Hannibal and Artaxias and the credit due each, one might consider ALEXANDREIA near Egypt: Alexander the Great is credited with founding the city, but it is clear that in the initial stages it was Kleomenes and others who actually built it. The Macedonian king was too busy rushing off elsewhere to oversee the day-to-day building of the new settlement. In general see Baumgartner, RE s.v. "Artemita 2"; R.H. Hewsen, REArm 16 (1982) 140; M.-L. Chaumont, Syria 70 (1993) 436-39. 1. For the suggested location see Chaumont, Syria 70 (1993) 437-39 and map on p. 433. For Artamet in the later Armenian sources see Chaumont, pp. 437-38. 2. The toponym Artemita was the name of an island (part of the Echinades archipelago) off the southwest coast of Acarnania. Due to silting, it (and other small islands) became attached to the mainland; see Strabo 1.3.18; Pliny NH 4.5; Stephanos, s.v. "Artemita"; and Hirschfeld, RE s.v. "Artemita 4"; Strauch, BNP s.v. "Echinades"; Radt, Kommentar 5:166. Stephanos (s.v. "Epiphaniea 4") is our sole extant source for an Epiphaneia on the Tigris. He adds that it had been called "Arkesikerta" and that it had been founded by Arkesios. A number of sources mention that Antiochos IV Epiphanes conducted a campaign against the Armenian king Artaxias probably in 165 B.C.1 Furthermore, the loss of the eastern Seleucid territories as a result of the defeat of Antiochos VII Sidetes in 129 B.C. at the hands of the Parthians makes it clear that-if Epiphaneia was a Seleucid settlement-it would have been founded before that date. The confluence of these facts suggests, therefore, that the founder was Antiochos IV. In general see Droysen, Hist. 2:747; Weissbach, RE s.v. "Epiphaneia 6"; Meyer, Ursprung 2:140; Tcherikover, HS 82; Mørkholm, Antiochus 116-17; Grainger, Prospopography 718; Mittag, Antiochos IV 203-4, 208; M.-L. Chaumont, Syria 70 (1993) 434-36; Fraser, Terminology 373. 1. For Antiochos's campaign in Armenia: Diod. 31.17a; App. Syr. 45, 66; Porph. FGrH 260 F38 and 56; see also Strabo 11.14.5 (Artaxias). In addition, see Mørkholm, Antiochus 166-67; Schottky, Media 192-95; Brodersen, Komment. 65. 2. For the location of Epiphaneiasee the map in Chaumont, Syria 70 (1993) 433. Note that in his enumeration of settlements founded by Seleukos I Nikator, Ps.-Dionysius of Tel Mahre mentioned AMIDA on the Tigris River. Assuming that this information is correct, one could further suggest that the settlement was subsequently renamed by Antiochos IV; cf. EDESSA/ANTIOCH on the Kallirhoe. But this is highly speculative, and I would not press it. The only extant source for Nicea Nialia is the Tabula Peutingeriana (XI.1).1 Undoubtedly, as J.-G. Droysen suggested, the reference is to a Nikaia, and "Nialia" could be emended to "Paralia." M.-L. Chaumont speculated that the reference could be to a Nikaia or a Nikopolis. We do not know the exact location. K. Miller suggested it was located southeast of Lake Urmia, in the vicinity of Sindschid or Sainkala.2 We should need additional information to affirm that the toponym recorded in the Tabula Peutingeriana reflects the (earlier) presence of a Hellenistic settlement . In general see Droysen, Hist. 2:747; Miller, Itineraria 782; J. Markwart, REArm 3 (1966) 313; Tcherikover, HS 83; M.-L. Chaumont, Syria 70 (1993) 441. 1. Chaumont also suggested that Nicea Nialia should be identified with Nicanicio in the Geog. Rav. 2.11.16 (ed. Schnetz). Note, however, that the Tab. Peut. (XI.1) distinguishes Naucanio (identical with Nicanicio recorded by the Geog. Rav.?) and Nicea Nialia (see also Markwart, REArm 3  313; and Chaumont, Syria 70  440 n. 41). 2. On the suggested location southeast of Lake Urmia see Miller, Itineraria 782 and 783-84 (map), followed by Tcherikover, HS 83, and Chaumont, Syria 70 (1993) 441 and map on p. 433. In general see Droysen, Hist. 2:748; Tcherikover, HS 84, 166; Sturm, RE s.v. "Nikopolis 8"; Brodersen, Komment. 162; Orth, Diadochenzeit 129-30. 1. Jones (CERP2 244, 452) dismissed the possibility that Alexander founded a NIKOPOLIS in northern Syria to commemorate his victory over Darius at Issos (see evidence and discussion in that entry). He admitted that Appian's description of Nicopolis as ἐν ᾽Αρμενίᾳ τῇ ἀγχοτάτω μάλιστα Καππαδοκίας (Syr. 57) was "odd," but suggested that it was "intelligible if it be remembered that Commagene was at that date part of Armenia." Jones was therefore willing to accept Appian's statement as evidence that Seleukos founded Nikopolis east of the Amanos Mountains in honor of one of his own victories. Olshausen (KP s.v. "Nikopolis 6") raised the possibility that the place had been founded by Seleukos ("originally under another name?") and then rebuilt by Pompey. 2. On the occasional errors in Appian's list see Cohen, Settlements in Syria 3. In general see Droysen, Hist. 2:748; Tcherikover, HS 83; M.-L. Chaumont, Syrie 70 (1993) 440. 1. Droysen suggested that the founder was the Seleucid Demetrios II Theos Philadelphos Nikator; followed by Chaumont, Syria 70 (1993) 440. Demetrios led a military expedition to the East in 140 B.C. (I Macc. 14.1 says the objective was Media. Josephus, AJ 13.184, says he went to Mesopotamia, planning to take control of it and Babylon and thereby get control of the upper satrapies. His plan was to make war on Arsakes and overcome the Parthians. Porphyry, FGrH 260.32 , says he marched against Arsakes to Babylon and the upper regions.) But the short duration of the expedition and his defeat (and capture by the Parthians) make one wonder if he had the time or opportunity to found a settlement in Armenia during the campaign. As for his epithets we may note that he is called "Nikator" or "Nikanor" in the literary evidence (e.g., Joseph. AJ 13.120 and Porph. FGrH 260.32 ). The epithet Philadelphos Nikator or (more frequently) Theos Philadelphos Nikator is found on coins (see, for example, Hunter. Coll. 3:67-70, nos. 1-16, 21-22; SNG Spaer 1598-1611, 1614-29, 1632-33, 1637-46, 1652) and in a fragmentary inscription from New Paphos (SEG 13:585.2-3; and T.B. Mitford, OA 1  146 n. 33). See also Brodersen, Komment. 216. Miller believed the settlement was founded by Arsakes II (Itineraria 781: "erbaut von Arsacus II Philadelphus"); however, I am not aware of any coins of Arsakes II with the single epithet Philadelphos. Tcherikover tentatively suggested Artabanos I (HS 83). For coins of Artabanos I with the epithet Philadelphos see, for example, Head, HN2 819; BMC Parthia 21, nos. 4, 11[? ]; Sellwood, Parthia2 58, 62, nos. 20, 22; Shore, Parthian Coins 98, nos. 59, 63-64. Note that Chaumont objected that the Arsacids did not normally give Greek names to the cities in their kingdom (Syria 70  440). 2. Location. Miller believed the settlement was located north of Lake Urmia in northwestern Iran, between the cities of Khoi and Marand (Itineraria 781 and 783-84 [map]; see also the map in Matheson, Persia2 77). Manandian also placed it on the north shore of Lake Urmia, between Khoi and Tasvich (Armenia 110, 113, and map on p. 111); Kiessling (RE s.v. "Filadelfia") remarked simply that it was in Media Atropatene. In general see Chaumont, Syria 70 (1993) 440. In general see Droysen, Hist. 2:747; Lehmann-Haupt, RE s.v. "Tigranokert"; Tcherikover, HS 83; Dillemann, Mésopotamie 245-72; Manandian, Armenia 58-63 et passim; Sullivan, Royalty 100-102; Sherwin-White, OCD3 s.vv. "Tigranes (1) II" and "Tigranocerta"; Biffi, Strabone 164-65; M.-L. Chaumont, REArm 16 (1982) 89-110; id., REArm 21 (1988-1989) 233-49; Sinclair, Eastern Turkey 3:361-63; id., REArm 25 (1994-1995) 183-254; and id., REArm 26 (1996-1997) 51-117. 1. For other ancient Greek and Latin sources that mention Tigranokerta see, for example, Strabo 11.12.4, 16.1.23; Pliny NH 6.26; Tac. Ann. 15.4; App. Mith. 84-86; Plut. Luc. 25.3-29.4; Ptol. 5.13.22 (on which see R.H. Hewsen, REArm 16  141-42); Eutropius 6.9.1; Tab. Peut. X.3 ("Triganocarten"). On the evidence of the Armenian Buzandaran Patmut'iwnk' (fifth century A.D.), which, according to Sinclair, favors Arzan as the site of Tigranokerta see, for example, REArm 25 (1994-1995) 189-93. 2. For the suggestion that Tigranokerta was founded at the site of an older, Assyrian town see, for example, Lehmann-Haupt, Armenien einst und jetzt 1:396-98 (followed by Tcherikover, HS 84); and Sinclair, REArm 25 (1994-1995) 214-15; id., REArm 26 (1996-1997) 94-95. 3. For the location see, for example, Sinclair, REArm 25 (1994-1995) 183-254 (east of the Tigris basin at Arzan); Lehmann-Haupt, Armenien einst und jetzt 1:395-98; id., RE s.v. "Tigranokert" (at the site of Silvan = Martyropolis); Dillemann, Mésopotamie 252-53 (Tell Ermen = Kiziltepe). For the various locations that have been suggested as the site of Tigranokerta and the advocates for each see, for example, Lehmann-Haupt, RE s.v. "Tigranokert"; B.W. Henderson, JP 28 (1903) 99-121; Dillemann, Mésopotamie 247-62; Syme in Roman Anatolia 61-70; Chaumont, REArm 16 (1982) 89-109; Sinclair, Eastern Turkey 3:361-63; id., REArm 25 (1994-1995) 183-254 and map 2 on p. 188; id., REArm 26 (1996-1997) 51-117. 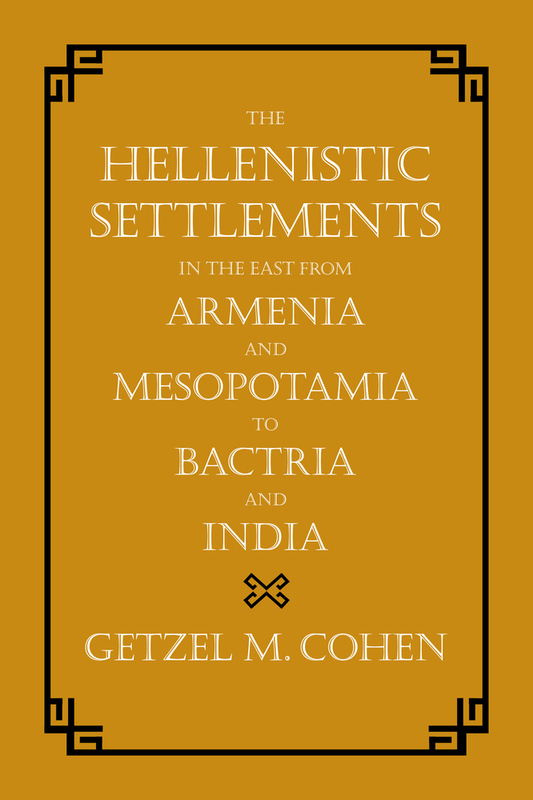 This is the third volume of Getzel Cohen’s important work on the Hellenistic settlements in the ancient world. Through the conquests of Alexander the Great, his successors and others, Greek and Macedonian culture spread deep into Asia, with colonists settling as far away as Bactria and India. 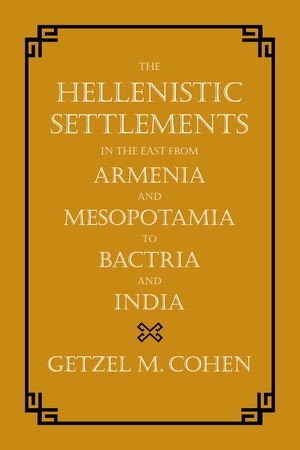 In this book, Cohen provides historical narratives, detailed references, citations, and commentaries on all the Graeco-Macedonian settlements founded (or refounded) in the East. Organized geographically, Cohen pulls together discoveries and debates from dozens of widely scattered archaeological and epigraphic projects, making a distinct contribution to ongoing questions and opening new avenues of inquiry. Getzel M. Cohen is Professor of Classics and Director of the Tytus Visiting Scholars Program at the University of Cincinnati. He is also Director of the Institute for Mediterranean Studies. Among his other works, he is the author of The Hellenistic Settlements in Europe, the Islands and Asia Minor and The Hellenistic Settlements in Syria, the Red Sea Basin and North Africa (both UC Press). Alexandreia ???? ??? ?????? ????? ?